Okay, so I said I'd run a few gemstone farming maps to try to find which really is more efficient, and gives best chance for gear drops. My rules are simple, 1 hour time-limit using same gear and stats. I'm using my primary character which is a decent, but not great, BH. This is the result for The Temple at normal. I varied my runs a bit and averaged a run per 6 minutes or so. I'll come back to that below. *edit- This is not the optimal TT run, for that, please see below. This is the result for Severed Mountain at normal. Each run took around 50-60 seconds and I killed Mag at around a 92% rate. I kill everything on the map because the mobs in the circle before Mag tend to drop gemstones every 3-5 runs. 135 gemstones for SM vs 101 for TT = a clear winner for SM. Both dropped the same amount of Purple and Legendary gear, but TT dropped a Legendary set piece, so that's a plus... And it was better than my previous set piece. For XP, I gained 3+ CL levels in TT and just a shade under 2 in SM. For gold, hands down TT, but who cares when you're running the grind? SM comes out heavily on top for gemstone farming with 211 total due to a beastly 51 common gemstones, with TT gaining 159 with new run (even different from video), and CoW last with "just" 101. I started the day at CL 160 and CoW was the first hour and gained 3 levels, as did TT in the second hour, while just 2 levels were gained in SM. The latest version of my TT run seems to actually be the best way to gain CL in an hour than the other tested levels due to the massive amounts of mobs. Also TT was the only run to drop a Legendary again. I personally find the 30 second runs of SM to be extremely hard to keep my attention engaged, and CoW was a little better at close to a minute a run, but for entertainment value I have more fun in TT runs though they take close to 2.5 minutes... But I'm engaged in the run! Conclusion- if you want gemstones in massive quantities run SM! If you want a very good amount of gemstones, and XP, and the occasional Legendary, run TT as it's seeking to be the best multi purpose run. I'll try to get a vid of the run I use now for TT up later today. This is the TT run I'm currently doing for good gemstones and XP. With commentary FWIW. First off, due to the squishyness of my BH, I had to start using one Maggie in the middle of my Heroic run due to dying a few times at the boss. Heroic produced 109 gemstones, 2 legendaries, and 3 complete levels of XP 185-188. It was not as fast clearing the level but rewards we decent enough. TT Normal gained 236 gems, 2 legendaries, and just a notch under 3 XP levels 188-190. TBD gained 215 gemstones, 1 legendary gun, and just a notch over 4 XP levels 190-194. WOW! I ran all the way through to kill Dragon so I could gather all loot, but I feel I did it in a very unique way so I'll have to get a video up later for you all to see. Conclusion- TT Normal is still one of the best gemstone and Legendaries run you can do while picking up some solid XP numbers. I really don't see any benefit to the Heroic run except legendaries as the XP gain was pretty much the same as Normal when you take a sliding scale as lvl increases into account. Let's just consider that dog laid to rest! TBD surprised the hell out of me with pretty much everything- massive gemstones, the gun drop which is a rarity, and that XP gain was a 'holy crap' moment when I saw the end of the hour run. My thanks go to Loque for putting me on that path for testing! ***As promised, TBD run recorded and ready for your viewing pleasure. ***Round 4- Comparison of Reign of Fire, Levanian Gardens, TBD Heroic, and TT. Well, I was looking for maps that would possibly be a short run and have plenty of mobs, and RoF and LG fit. RoF was first and gained 105 gems, zero Legendaries, and just 1.65 XP levels. LG was next with 112 gems, zero Legendaries, and 2.1 XP levels. TBD Heroic gained 102 gems, 2 Legendaries, and 3.9 XP levels. TT gained 170 gems, 2 Legendaries (both socketed Assault), and 2.4 XP levels. RoF and LG both proved to be decent runs for the time spent, but LG barely dropped green gems and neither level dropped a Legendary. They won't be added to my list of runs. I had previously 'debunked' the idea that Heroic level would give more gains with my TT Heroic run, but wanted to do one more try. TBD Heroic gave me tons of XP and a couple of Legendaries, but the gems were not worth the hour, especially considering the last test. But that XP??? Yeah, even Led would agree that it is the best XP run regardless of style or level. Per hour XP, TBD is the best, period. TT showed it's worth again with the most gems, the best Legendaries, and a very fair amount of XP. ***This is the last comparison. I've proved (I think) what I set out to do- which is finding out that for gemstones, TT is the best level to run. I got the bonus of finding out that TBD is the best level to run for XP and is right there with SM for gems. I've also shown that, for the time involved, Heroic offers less gain than Normal level for gems and gear.... But may give a little more XP. Sorry, but I'd rather have the gems and gear for the time involved! *** I couldn't stay away. I wondered what would happen if I ran the 3 best levels in an hour- the Trips. Here's the results- TBD, TT, SM in that order. So, I did a timed run of 20 minutes each. I somewhat wish I had taken screenshots after each portion, but whatever. 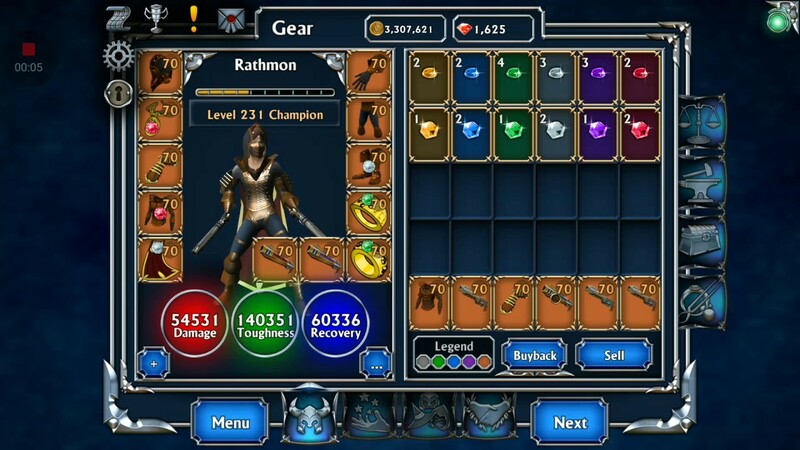 I gained 240 total gems, 2 Legendaries, and 2.4 CL. The best part? I wasn't bored at all. If you're keeping track, that's the most gemstones in an hour I've seen through this whole experiment. I think I'm absolutely done now. This is the way I do BH runs on SM normal now- think it's close to the speed that Led gets on his warrior. Before and after of the 20 minute runs. Before and after the 1x1x1 rotation. As you can see, I started each run with gems already loaded so I didn't have to worry about inventory management... Until I did. The previous top run (240) of 20 minutes each hit a new high of 253 gems gained. Toward the end of the run I may have missed out on a few due to not managing the stacks of gems that had hit 20....oops. I gained 2.1 CL of XP and 3 Legendaries. I screwed up again by not taking pics between levels. Guess I'll have to run it again! Hoping for some RNG goodness, and since I don't need a minion to kill Mags in the beta, I decided to revisit my original idea for the Trips- rotate 1x1x1 starting with SM and ending with TT. Not a shabby hour- 213 gemstones, 1.85 XP, and 1 Legendary. This I did take pics of every 20 minutes, which resulted in 75,64,74... And the middle 20 minutes was the only time I missed a Mags kill. Well, it was certainly a slog to change levels every single time- I have the runs down so well that each rotation took a shade under 5 minutes. The load times were longer though, in comparison to running the same level over and over. Does the beta drop more? Well, hard to tell because I did change my runs to minimize my time standing around waiting for loot to fly. I'd say if there's a change, it's absolutely miniscule. My current standard of determining testing is a 20 minute run, which should give me a minimum of 10 runs per 20 minutes on longer levels, and twice that for hit-it-and-quit-it runs. CoW was a test (again)- 44 gems and 6.5 bars of XP. I don't know how other people get gems there, but on my BH it's not a viable level. Path of Sand was another test, 53 gems and 5 bars of XP. Decent, but not close enough to the 75 gems in 20 minutes I recorded in Trips 1x. Next up, adding a Mawrth run to the rotation as I've been testing a good, and fast, path. I also did a test of Key runs in the beta- but that's a different thread for another day. After finally crafting an XP ring (do you know how often quality XP rings happen? Not enough, but the the useless gold rings are plentiful.. anyhow, not to get too off subject..) I call this run the Quads, because there's 4 levels to run for 15 minutes each. And I forgot to take a screenshot after each yet again- call me focused or absent-minded? I was in the zone. It went like this- Mawrth, SM, TBD, TT and it came damn close to my record with 249 gemstones gained. Only 1 legendary dropped and 2.9 XP lvl​ were gained. Overall, a good run for the hour. Last edited by Rathmon; 05-19-2017, 04:56 AM. 1. I'd be curious to see the CoW 2-3 mob view. I know I clear XP faster there than SM, but don't get quite the same gemstones. 2. How are you running Temple? I've tried it several times since it's come up recently, but it's always low value for me. I rarely get purple, except the boss, not sure I've ever gotten a legendary, and honestly, except for the last room, I don't even like playing.... But I go straight through the middle. 3. Just because I've seen it come up, I started running straight line Siege of Anderhelm. I think it will end up losing in both gemstones and CLs, but you sure can kill a lot. Good to see someone taking the initiative and time to do this analysis. However, by doing a single run or two is not good enough to really see the results. If possible, try to make it 10 or more runs under the same gear, stats and condition. The more runs the better. And with exact stats and gear, do the same for other maps of interest. I'm not very keen in comparing the CL gains for I fear the results weren't as accurate as you might think. The experience needed from Champion Level 100 going to 101 may not be the same for 101 to 102, and so on. You cant compare CL gains. Some ppl run with 0% bonus exp while others wear 600%. The only thing that makes sense is gems per run. 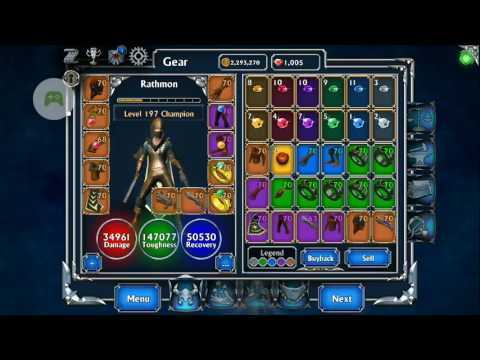 @abc127- My new version of TT run is pretty cool- no minions and a little more speed gear gets me through it in close to 2.5 minutes. I'll record one just to show what I think (for now) is the optimum path. I think SoA is a bit of a slog, but I'll add it to the list of runs to measure. The problem with CoW for my play style is that I have to go back for whatever treasure dropped which isn't efficient. @Toot- I plan on running multiples of the timed runs, especially when I change gear or find new tricks. I'm at the point where I'm ready for my 'perfect' rings, so my current focus is mainly gemstones, and I think there's other players in the same position who can benefit from these tests. XP is just a bonus component, as are legendaries. Of course, the XP curve is a pain for comparison, but at CL 150 I'm getting at least 1 segment of the meter per TT run.... It would be nice if the game had a number for XP so I could do a better comparison. @Wolna- see above statement about XP.... 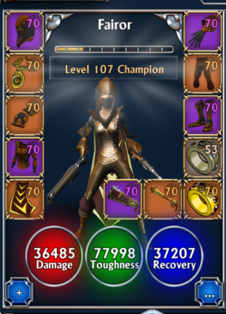 However, I'll argue the point that regardless of the % XP gear anyone has, it'll still be the same gain comparison. If a level has the opportunity of 15% more XP than a comparable gemstone level for the 60 minutes, I'll take the extra XP because I'm trying to grind efficiently. However, different ppl with different gear/CL/exp%/skills have different Exp per map or time. U can easily compare gold&gems per map played, but every player has to find his/her own time per map when you want to be effective. Sure, but the relative performance would still be relavant. If one run produces 50% more xp, it's still a lot more for anyone, no matter your build or level. As long as you don't take the values at face value, it's useful. A basic reality of math is that it's constant- it doesn't matter if you have 500% XP gear or 150%. If TT gains 15% more in the same time frame as SM, then it's going to be 15% more of 500% or 150%. Regardless, even that is going to be affected by RNG because the mobs are not consistent throughout. That's why I'm trying to get a sold basis of comparison by doing it for the same amount of time over and over. Added a video of 3 runs on TT to first post- not perfect and no commentary yet, but you'll get the idea of how I think it's best to run. Last edited by Rathmon; 04-08-2017, 06:30 AM. I'll just wait then, if you think you are right. I suggest you reserve two rows of your hero's inventory for gems to reduce inventory management. You're overdoing things by clearing your inventory after every run. Any reason why you're not taking any companions to help speed up your run? Three archers is better than none, just saying. I too like killing those large packs at the top & bottom room but is it worth the time running back and forth? I guess this is something worth to reconsider. @Toot- I'll play around with not going top/bottom at the beginning, but I'll probably add another part to the run because it occurred to me that whenever I've gotten a Legendary drop it's been from a chest that I'm not hitting in my latest path. Those 3 runs were surprising due to getting 26 gemstones in 8.5 minutes or so... I'll take a 3 per minute drop rate! You're right about inventory mgmt, when I do an hour run I get enough gems to reserve the spaces. Selling the trash drops is just habit... It's not like I currently need the gold. As far as minions, they just slow me down in TT because I want mobs to follow me into traps. I don't like when minions pull aggro as I speed run. Latest batch of runs done and posted in first post- it's CoW vs TT vs SM this time. Next will be a test of Heroic level to see if there's better drop rates there or not! 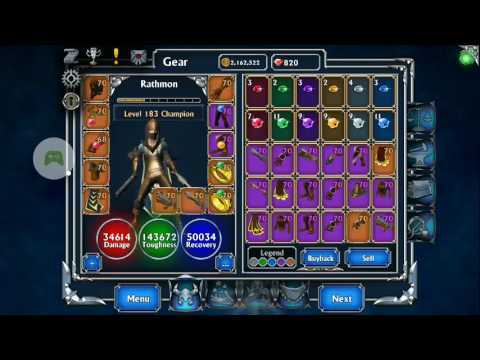 As promised, though late, a new video posted in the first thread of my latest TT path. This is my permanent and best path for max XP, gemstones, and Legendaries. With commentary! There is a relatively faster way of farming TT: pull the mobs making a first concussive shot from far away, gathering groups together (I also run it without companions, vortex+reflecting aura is instant death), place traps and let the party begin. I managed to bring down the TT timer to around 2 minutes doing a similar path as the one from the last video. EDIT: nevermind about pulling groups. Now I'm using 4 pieces of the Assault set and the speed boost when attacking makes grinding TT ridiculously faster. P.S: I've been trying to add you for the last couple of days, but the system always return the "bad ID" error. Would you mind checking the code? Last edited by hades0505; 04-13-2017, 07:46 AM. @Hades- My user code was wrong but is now fixed, thanks for pointing it out! I tried doing a bigger/wider mob pull but some of the monsters are too slow and my guy would keep running back to get them. So I generally only do that with the wheelies or doggies as they are fast to catch up. You can see that most mobs are destroyed instantly so it's easy to keep moving. Besides, I love the Metallica references from the automatons as I scatter their parts across the map. 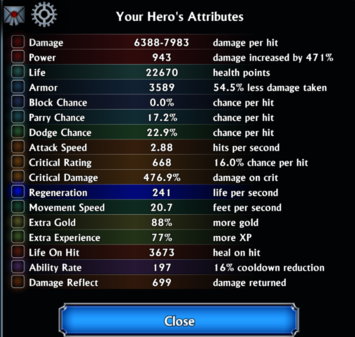 Here's my current stats with farming/speed gear. I'll probably craft some exp rings soon to boost the level gains as I go up higher. Think I'm currently at CL 183.